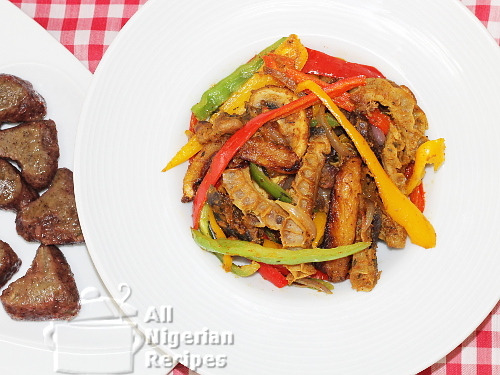 This Nigerian Stir-fry recipe was developed by our very own 9jafoodie. It is such a tasty main dish, side dish, sauce, whatever you choose to call it, it will answer! Keep reading to see why this deserves to be called the National Stirfry of Nigeria. Please note that I made a few substitutions to 9jafoodie's original Ultimate Nigerian Stir-fry recipe. I also added my own favourite ingredients. For a low carb version, skip the ripe plantains. 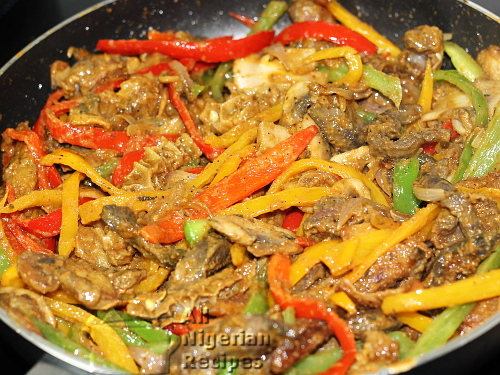 Feel free to use your favourite parts of beef when preparing the Nigerian Stir-fry. Other meats can be included too especially meats that have a rubbery texture. Do check the original recipe for more meat ideas. Use ripe but firm plantains for this meal. I used Italian coloured recipes. These look like Nigerian Tatashe peppers but they are not spicy. You can also use bell peppers (also known as Salad Pepper in Nigeria). The job of the red onion is to add colour to the stir-fry. If you cannot buy it where you live, use any onion. Nigerian curry powder is not the Indian curry powder. Popular brands include Ducros and Lion. You can buy it from Nigerian markets and African food shops all over the world. Rinse and slice up the vegetables, 1 onion (preferably red onion for colour), plantain, mushroom and meats as shown below. Click each image to enlarge. Cut the other onion into 4 chunks. Cook the meats with the stock cube, the chunks of onion and as small quantity of water as possible, starting with the toughest meat. So cook the shaki for some time then add the heart and gizzards and cook till done. When the meats are cooked, separate from the stock/broth and set aside. Use the stock to mix the suya pepper thyme and curry powder. You can also use water. The quantity of the stock/broth or water you will use for the mixing depends on how much sauce you want in the stir-fry. To play it safe, mix the aforementioned ingredients with as little liquid as possible then add more liquid during the frying. Deep-fry the plantains till golden and set aside. Pour the vegetable oil into a pan, pot or wok and once it heats up, add the cooked meats and fry till they start to brown like shown in the video below. If you are using a shallow frying pan, you will need to fry the ingredients in several batches. In that case, divide the oil and other ingredients accordingly. Once the meats start to brown, add the mushroom and onions and fry for 2 minutes. Add the coloured peppers and fry for 2 minutes. Add the suya pepper, curry powder and thyme mix and stir very well. Add more stock at this time if you wish. Finally, add the fried plantains and stir very well. The Ultimate Nigerian Stir-fry is a meal in its own right but you can serve it with Boiled Rice, Boiled Yam or Dan Wake.